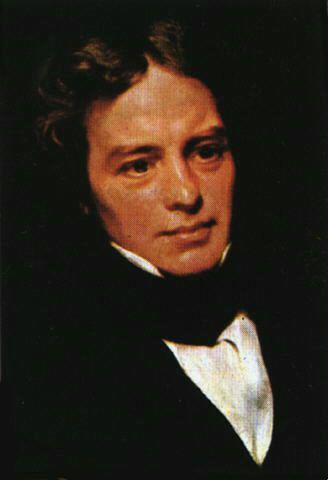 Michael Faraday (1791 – 25 August 1867) was an English physicist born in South London. He remains best known for his contributions in the fields of electromagnetism and electrochemistry. Specifically, his main discoveries include electromagnetic induction, diamagnetism, and electrolysis. Perhaps one of his biggest contributions came after he reproduced Oersted’s experiment, ultimately noticing a bonafide relationship between electricity and magnetism. Previously, a compass was thought to only be affected by magnetic fields, but this experiment proved that the needle of a compass CAN be affected by electrical currents. Building from this experiment, Faraday discovered that a magnet suspended in the air would revolve around a current bearing wire, which ultimately led him to conclude that magnetism is a circular force. This disproved the notion set forth by André-Marie Ampère, who maintained that magnetic forces were linear. One must note that this was an interesting feat for Faraday, as he didn’t understand most of the complex math put forth in Ampere’s papers on the subject. Regardless, his observations wound up leading to a flurry of activity within the electrodynamics research field. Thanks to the experiments on magnetism and electric currents, Faraday formulated the second law of electrolysis, which says “the amounts of bodies which are equivalent to each other in their ordinary chemical action have equal quantities of electricity naturally associated with them.” After much graveling in dielectrics in a capacitor, he abandoned the concept of electronic forces in favor of “lines of force.” Using iron fillings, said lines can be made visible with a simple magnet. – The “Faraday cage” which is an enclosure formed of mesh or a similar conducting material to prevent electric charges from external static and non-static fields. – The invention of an early version of the ‘bunsen burner.’ Many are still used in chemistry labs all across the world. – Faraday is largely known to be the first scientists to make electricity in homes both practical and feasible. His work ultimately gave way to the first electric motor. Random fun bit of information: Daniel Faraday, a physicist from the television show ‘LOST,’ was named after Michael Faraday. New Video: 11/22/13 – What is Sound?